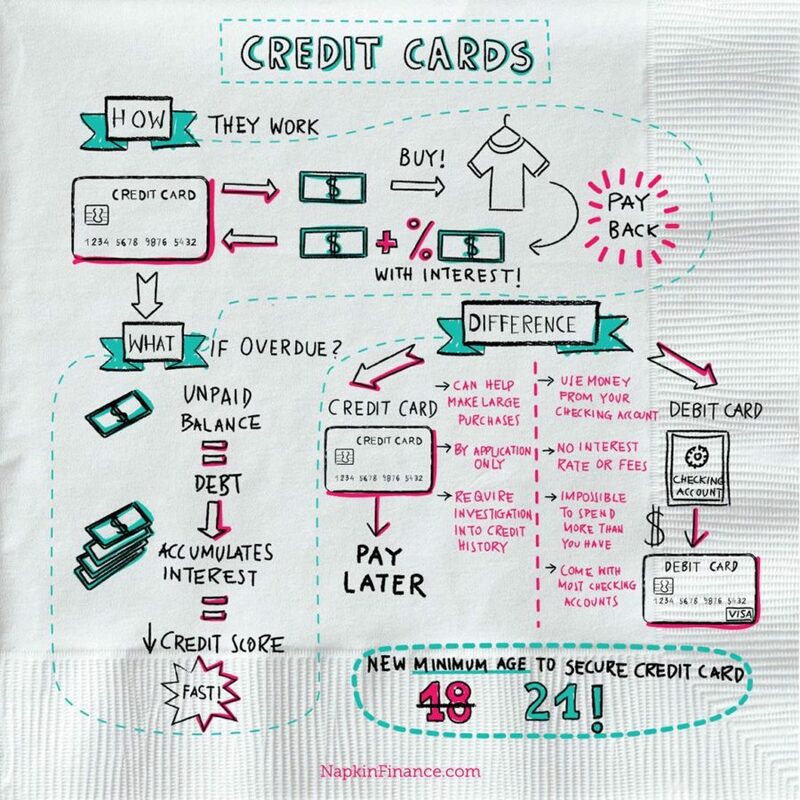 How Does a Credit Card Work? 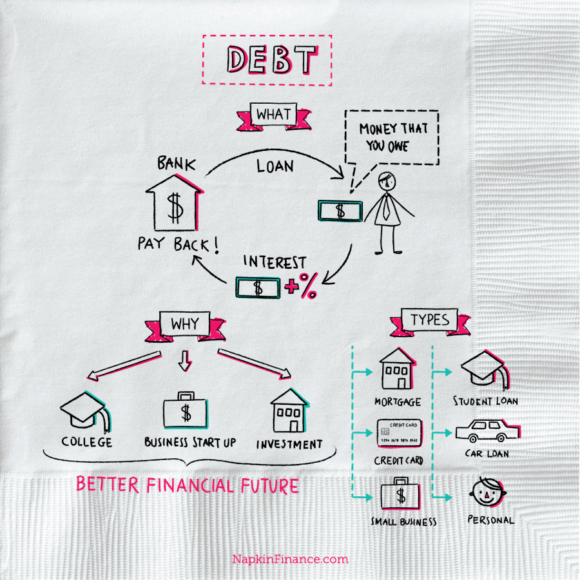 Napkin Finance guides you through the noise. A credit card is a payment card issued by a financial institution to help you buy goods and services and make purchases without cash. It is a financial tool that allows you to borrow money to make purchases. Those purchases are repaid at a later date, either in full or over time with interest. 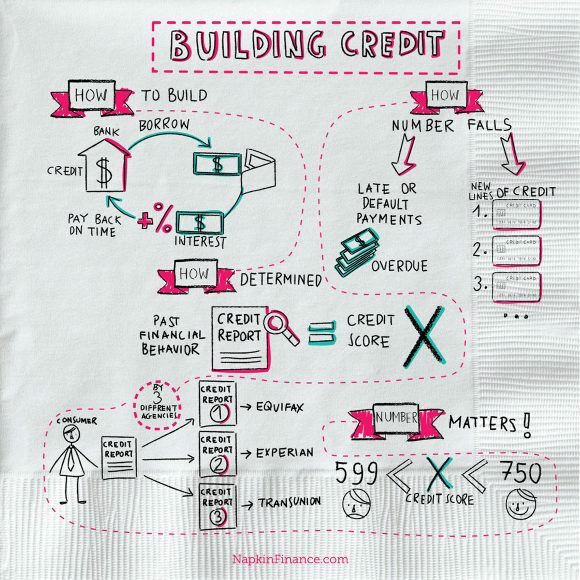 Credit cards are revolving credit. This means that you have a set credit limit, which is the maximum you can charge to the card. As you make purchases, your balance goes up. As you make payments to the card, the balance goes down. There’s a minimum payment due each month. This amount can fluctuate, based on your balance. The difference between credit cards and debit cards: a debit card is linked directly to your checking account. When you spend with your debit card, the money is automatically deducted from your account. There are two basic types of credit cards: secured and unsecured. A secured credit card requires you to put up a cash deposit, which typically doubles as your credit line. You can make purchases against this credit line, and as you make payments, that frees up available credit. The deposit may or may not be refundable, depending on the card. Secured cards are designed for people who are new to using credit or are rebuilding credit after a serious credit misstep, such as bankruptcy. Secured cards can be a stepping stone to getting an unsecured card. Unsecured cards don’t require a cash deposit for approval or to request credit limit increases. These are the most common type of credit cards, and they often have lower interest rates and better rewards programs compared with secured cards. What is the cost of using credit cards? Credit cards have several costs to consider. 1. APR, which is the annual percentage rate. This rate represents the annual cost of borrowing if you carry a balance on your card. Credit card APRs are usually variable, not fixed. The rate is tied to an index, and if that index goes up, your APR can increase too. These rewards are earned as you make purchases. For instance, you may have a card that rewards you with 2% cash back on every $1 spent. Some cards offer additional incentives, such as bonus rewards for new members who spend a certain amount in the first 90 days or yearly bonuses on your account anniversary. One caveat to note here. The more rewards or benefits a card offers, the more likely you are to pay an annual fee. You may also need a higher credit score to qualify for cards that offer the most attractive benefits. The first general credit cards had a limit of $300 and were made of paper. All credit cards in the United States stacked up would form a tower almost 300 miles high. There are two credit cards for every member of the population of the United States. The famous “Black Card” of American Express is actually called the “Centurion Card.” Since AMEX never had a trademark for this card, Visa trademarked it and is now rolling out advertising campaigns for its own Black Card. Before President Obama signed the Card Act in 2009, you could sign up for a credit card when you were 18 years old with few restrictions. Now, you must be 21 years old to apply for a card unless you have a cosigner or can show proof of income.